Sadly, I've been neglecting this blog and I'm sorry for that, but I'm hoping to use it a lot more again. 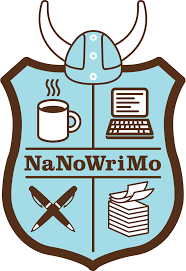 So here in Authorland, November means NaNoWriMo (National Novel Writing Month). I've only technically participated in NaNoWriMo about twice. And I actually finished it (meaning, I actually wrote 50,000 words) ... once. Sad, isn't it? Well, this year I am going to give it a shot. I'll be cheating a little because I have a book that needs finishing, so I won't necessarily be starting a brand new project this month, and I also have edits coming on a book sometime soonish, so we'll see how long I can write before having to switch gears. It feels as if, with each book published, I'm able to just WRITE less and less easily. I fiddle with every sentence, worry over every word choice, analyze the plot constantly. I love NaNoWriMo for the purity of its lesson: let the muse lead you, and worry about fixing it all up later.